OBECTIVE: To fly a two-seat microlight over Kilimanjaro in January 2008. Fly a two-seater microlight over it? Well, it was a challenge, but this is an experienced team with the same equipment as was flown over Mt. Everest in 2004 and Aconcagua in 2005. The difference this time was the objective to fly over the mountain with a crew of two people rather than towing a hang-glider solo. 13 Jan 2008: Richard Meredith-Hardy and David Barker. 15 Jan 2008: Mark Jackson and Janelle Barker. 17 Jan 2008: Richard Meredith-Hardy and Fons Nijenhuis. 19 Jan 2008: Mark Jackson and Eve Jackson. As a secondary element, it was also thought that we might be able to take advantage of favourable meteorological conditions we might encounter in the Kilimanjaro region to challenge the FAI World altitude record of 6876m (22,556 Ft) and, depending on how hot it was, the FAI World record time to climb to 6000m of 33 min 15 sec for this class of aircraft. The result was a stunning success, and claims are now in for a new World altitude record of 7395m (24262 ft), a new World 'Time to climb to a height of 6000m' record of 25 min 48 sec and a new Rritish 'Time to climb to a height of 3000m' record of 9 min 40 sec. As wide as all the world, great, high and unbelievably white. On the night before our third flight there was a snowstorm later described by people who were actually on the mountain as 'one of the most severe in living memory' which painted Kibo white right down to the saddle. Our view was just as Hemingway described it and a perfectly stunning sight. In the longer term however, the permanent snows are said to be receding due to global warming so it was a tremendous privilege to have seen it as Hemingway imagined it to be. The aircraft is a P & M Quik GT 450. This is a classical 'weightshift' control machine and is the best of its kind available today. This aircraft is the same one which Richard, Brian Milton and blind co-pilot Miles Hilton-Barber flew from London to Sydney, Australia in the spring of 2007. The crew will be using the same high altitude specialist equipment as proven on Richard's previous high altitude flights where temperatures of minus 25° C at altitudes where without oxygen the normal ‘time of useful consciousness’ is less than one minute can be expected. 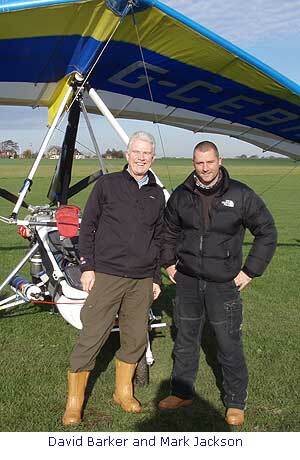 David Barker has been flying together with Mark Jackson from Barton for over 10 years. He met Richard in Portugal 2006 whilst he was flying to the Iberian peninsular but were prevented from crossing the Pyrenees because of bad weather. He lives in Bowdon, Cheshire. Mark Jackson is a company test pilot for P&M Aviation. He has been been flying microlights for 18 years and a CAA authorized flying instructor, BMAA inspector and check pilot at the Mainair school of flying for 12 years. He competed in the Madrid to London rally, flying there and back solo in a 462 Mercury and in about 8 round Britain rallies. He flew from John'o'Groats to Lands End and back to John'o'Groats in a day solo. He has been awarded FAI Bronze and Silver Colibris. He lives near Manchester, UK. Richard Meredith-Hardy Was the first person to fly a microlight from London to Capetown in 1985/6 and attempted Kilimanjaro on the way, but his 447cc two-stroke only made it to just over 18,000 ft. In 2004 he flew over Mt Everest as part of an expedition to tow the Italian pilot Angelo d'Arrigo in a hang glider to the summit. 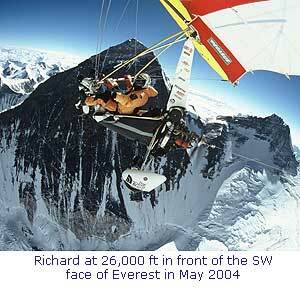 He towed Angelo over Mt Aconcagua in Argentina, the highest mountain outside the Himalayas in 2005. 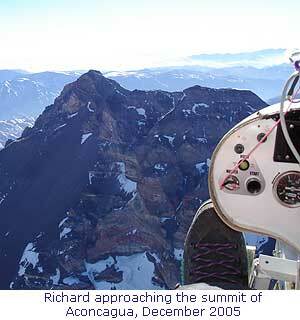 In March-April 2007 he flew with blind co-pilot Miles Hilton-Barber from Rhodes to Sydney, Australia. He has been World and European microlight champion and has been awarded the Royal Aero Club gold medal and the FAI Gold Air Medal. He lives in England 50 Km north of London.